It is Monday morning and I am in front of the laptop and not the loom – I am an unwell sniffley bunny, cuddling a hot water bottle and a tub of Vicks. Ah well, at least it gives me a moment to catch up with my posts. 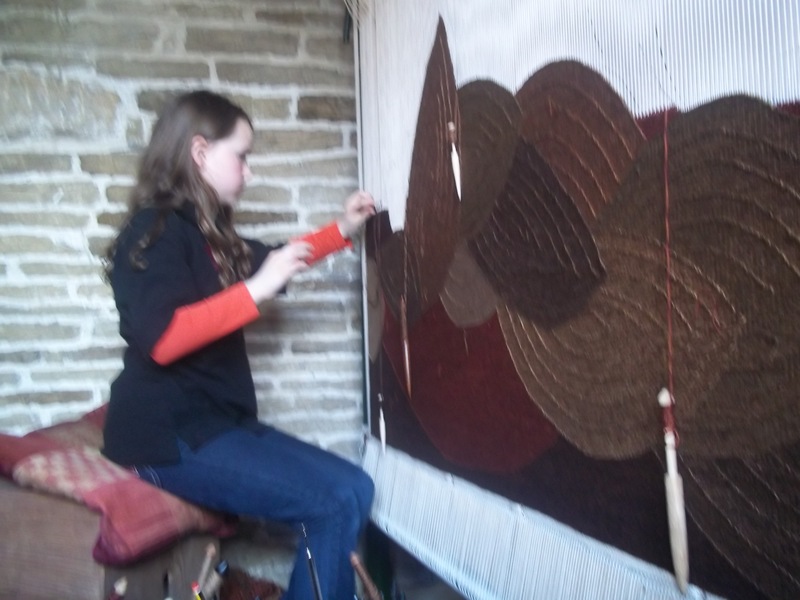 I’m now halfway through the project and miraculously I also hit the halfway mark on the tapestry – it is nice when one’s calculations actually work out. The design is now clearer to anyone looking at her, she no longer exists just in my head, she is no longer just mine – I don’t know if any of that makes any sense, but I guess she has been part of my life quite intensely for a long time and there comes a point where one has to accept that she is not mine to keep and is hopefully destined to live elsewhere. I’ve been taking photographs at the end of each day and putting them together and have enjoyed watching her build up – I was going to leave this until I had finished it completely, but it seemed a way to celebrate the half way stage. Oh it seems I can’t add videos here without coughing up some loot, but it is over on my FB page is you want to take a gander. I got a lovely present from a wood-turning visitor keen to try something new. 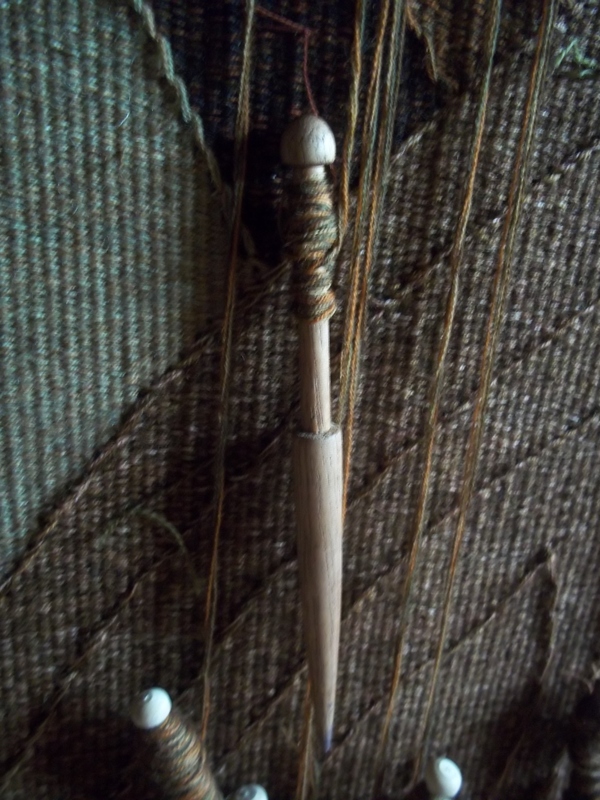 It really is my favourite bobbin now, such a great shape, and it has got me thinking about having a go on a lathe myself. I know there is one over at the Hive in Shipley, perhaps once this is over I think about it seriously. Another nice surprise was the project getting a little mention in the Guardian Guide which was an unexpected loveliness; my very missed brother – who was the real artist in our family – must be looking down and having quite a chuckle. As for Riddlesden, the breeze brings is bringing in the smell of the buxus from the sunken rose garden below my window, and it takes me back to my grandparents’ garden every time. 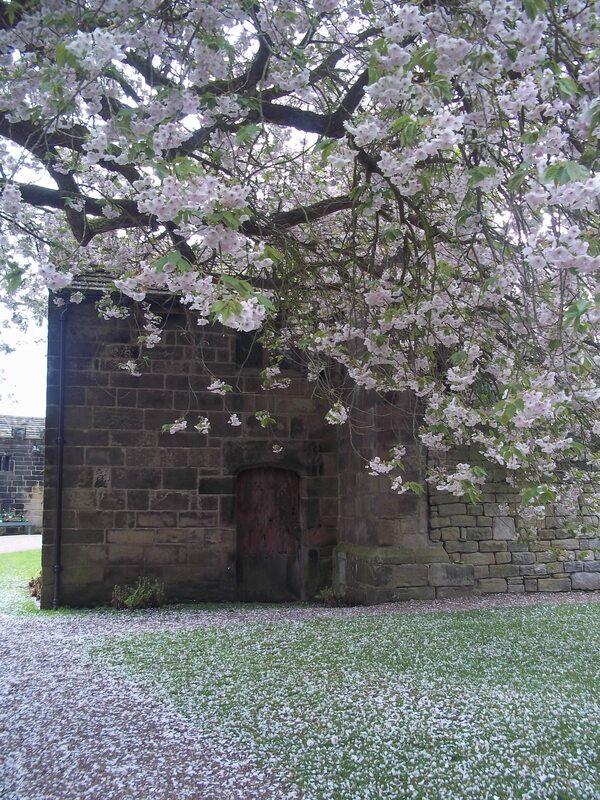 The falling blossom is coating everything white and pink, and ducklings have started appearing on the pond in front of the house. I am going to be so sorry to leave all this behind. < Previous Weeks 6 & 7: Skullduggery!